Pink Heart String: New & Upcoming Lalaloopsy Dolls, Babies, Bubbly Mermaids and More! 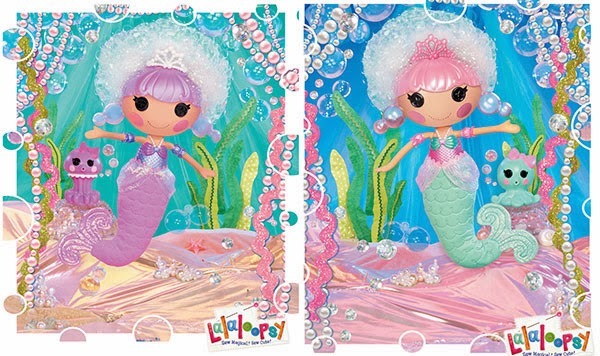 New & Upcoming Lalaloopsy Dolls, Babies, Bubbly Mermaids and More! I haven’t been able to dig Lalaloopsy stuffs online for a long time especially after the super typhoon. But I have a lot of things to share to you. I guess that some of you have seen these new Lalaloopsy releases but still, I’d share this because my readers will surely love to see this. While we enjoy seeing the large Lalaloopsy with their Little sisters, there is an even younger version called Lalaloopsy Babies. When I saw their lovely picture, I was like, “Waaahhh. They are cute!” But looking closer made me notice that their bodies was kinda deformed or something.lol. Anyway, what you see in the image below are the Lalaloopsy Babies showing Jewel Sparkles , Mittens Fluff 'N' Stuff, Pillow Featherbed and Crumbs Sugar Cookie when they were still babies. Spot Splatter Splash and Bea Spells-A-Lot were just added and doesn’t have pictures yet. Lalaloopsy Babies are the recent Lalaloopsy spin-off line with plastic heads and soft bodies. The babies are wearing diapers, a pacifier and a hat. 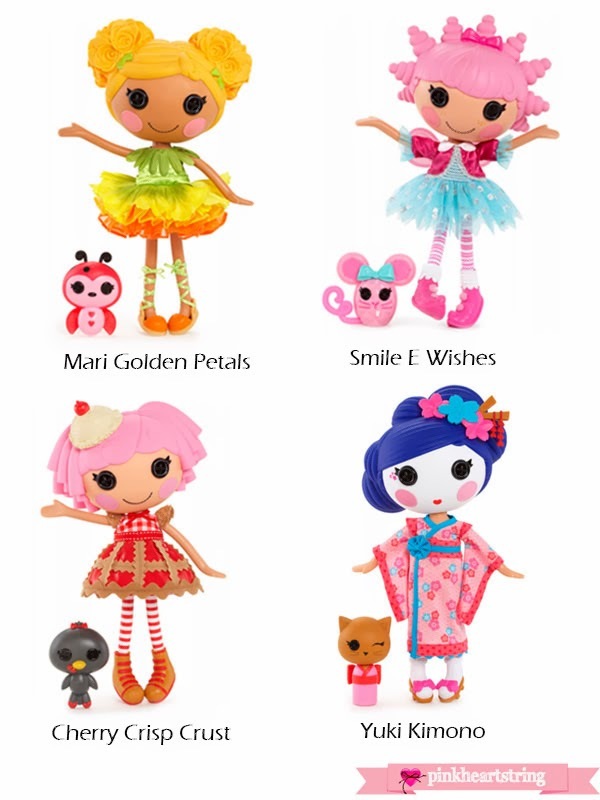 They bear patterns and colors from the large Lalaloopsy versions. Pets are bottle shaped to match their personality. These mermaids are said to make bubbles which is one feature that made them lovable. Isn’t it beautiful? But it wasn’t released yet and I am sure you are looking forward to this one! These are Pearly Seafoam and Ocean Seabreeze. I’m not yet sure which is which. There are four new large dolls that are up for release in 2014. They are Mari Golden Petals, Smile E. Wishes, Cherry Crisp Crust and Yuki Kimono. Mari Golden Petals bloomed from a marigold on October 1st. She’s got a beautiful new bouquet hairstyle in a rich gold color that matches her dress. The dress itself definitely resembles a flower, turned upside down. Her pet is a ladybug. She was bloomed and was not sewn that is why she'll come with a flower shaped tag. Her hair has beautiful flowers on it. Smile E. Wishes looks like a fairy with lovely combinations of pink and blue. Her hair are like ice cream twirls in pink. Yuki Kimono is a giggly Geisha version for a Lalaloopsy. She has that lovely Japanese hairstyle too. Cherry Crisp Crust was originally part of the Dessert Shoppe mini-series. She will be released together with the new large Lalaloopsy dolls. You sure loved the large dolls released this year and they were currently released with mini versions for Confetti Carnivale, Peggy Seven Seas, Haley Galaxy and Teddy Honey Pots. They all come in lovely boxes that were shaped based on their personality. Another batch of new mini-lalaloopsy dolls are on its way and would be part of the series called Flower Garden Mini Series. This features Mari Golden Petals too together with Bluebell Dewdrop, Happy Daisy Crown and Rosebud Longstem. Bluebell Dewdrop has sort of an elf thing going on with her purple pointed shoes and star wand. She’s also got a teapot and cup and her pet is a dragonfly. I love the simple sweetness of her dress, although I could live without the flower hat. Between Mari’s cake and Bluebell’s teapot, they should be able to have a lovely garden party! Happy Daisy Crown is sporting a lot of daisy chains! One across her head, one as a removable lei, and one as the handle for her basket. She has daisies on both sides of her head and her umbrella is just one giant daisy. As for her pet, I think it’s a worm of some kind. Rosebud Longstem is completely rose themed. Her pigtails are adorned with a large rose and her pet is a leaf winged butterfly of some kind. She also has a rose bush, a purse, and a mirror (or brush?). I definitely hope to see these minis as large dolls, especially Rosebud! Okay. I just realized I haven’t written about the Littles in the blog but anyway, here is a picture of the new Littles showing Tiny Might, Twirly Figure Eight, Mimi La Sweet, and Spoons Waffle Cone in the front row which will be released soon. Well, from their names alone, you can easily identify whose little sister they area. I like Mimi La Sweet, she is so cute and pretty. Even Tiny Might is cute too especially in her attire. 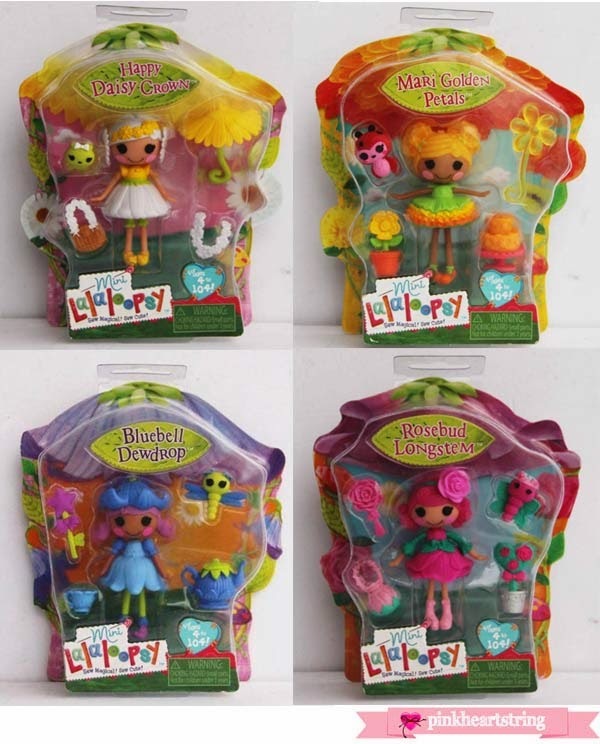 So, have what can you say with this new Lalaloopsy Dolls and Line-ups? Disclosure: Items above are affliate links. The author of this blog will be compensated once you purchase through the link. My daughter likes dolls a lot, but really prefers the more realistic ones. 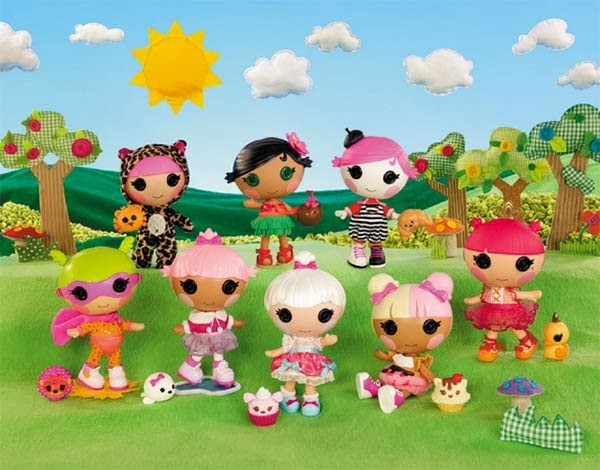 Still, I think the Lalaloopsy dolls have cute names and I like their little animal friends. Aww I love the baby ones - their pacifiers are too cute! We love Lalaloopsy! This is great. I didn't even know they made baby dolls! This one is really a good post, all this is very nice dolls, I really like it, thanks for sharing such a nice post with us. I am happy that I found your post while searching for Baby dolls. It is really very nice dolls, I really liked it, thanks for sharing.